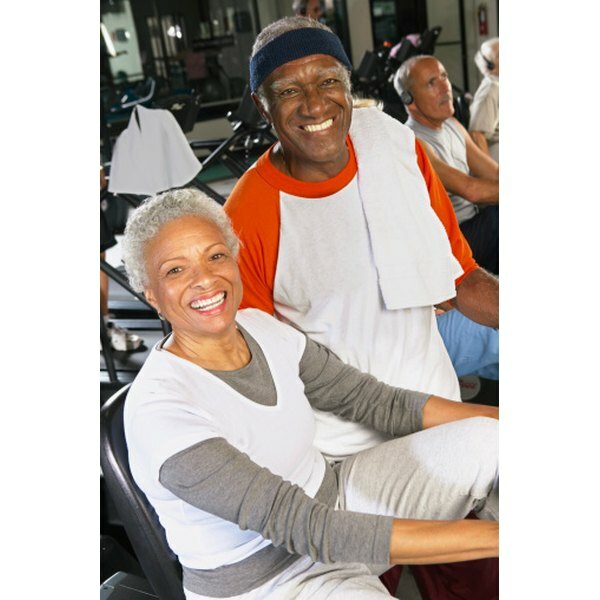 Senior singles enjoy working out together at senior-focused gyms. Singles over 60 should be ready to take advantage of the best that the next chapter of life has to offer. Some are focused on finding a new life partner, while others are content to build a network of people who share common interests and pursuits. The good news is that the pool of older folks is growing, and you can find interesting people all around you if you know where to look. Whether it’s watching movies, playing bridge, bowling or enjoying a new restaurant, meeting people who share your interests is an easy way to make new friends or meet potential partners. Look for clubs in your area that are geared toward people your age. You might find a seniors golf club or a group that attends theater or dance classes together. Check the bulletin boards at your local senior center for information. Besides reaping the many benefits of physical activity, dancing lessons will get you out of the house regularly to meet new friends in a festive setting. Look for dance classes for adults or seniors sponsored by local adult schools, private and community organizations and churches. Lessons are offered in many styles (ballroom, salsa, swing, square-dance, folk) and skill levels (beginner, intermediate, advanced and competitive). Hobbies such as toy-making, weaving, landscape painting and pottery-making are even more enjoyable when you share them with others. Classes are offered in craft, knit, or sewing shops, adult schools, senior centers, art schools and community colleges. You might consider supplementing your income by selling your hand-crafted items in senior arts and crafts fairs. You can find many of these classes at local hobby or craft stores. You may not want to run a marathon, but you can still benefit from breaking a sweat. Even if you've never been very active, considering joining a gym for seniors. People over 50 like to work out with people their own age because they have similar fitness goals. Gyms are a great place for older people who care about their health to meet and work out together. New cultures, exotic vistas, delicious cuisine and new friends and companions can all be yours with the help of travel clubs and organizations that cater to the interests and needs of older people. You can participate in small-group adventures, network with solo travelers or look into volunteering overseas. Contact local travel agents to see what travel plans are geared toward seniors. There might also be travel opportunities with local senior groups or community centers. Taking college courses helps you learn new things and meet other singles. Many college campuses offer community courses, such as in art, psychology or other fields, that are free to adults in the surrounding area, including seniors. You'll have a chance not only to acquire new skills and information, but also meet people who are in a similar point in life as you. Contact local universities to find out if they offer these types of activities for seniors. Lorena Cassady has written professionally since 1982. She was an instructor and mentor teacher for a Bachelor of Arts in management program and has administered a home-health agency. She has been published in "Traveler's Tales" and holds a Master of Arts in English and creative writing from San Francisco State University. Cassady is bilingual.